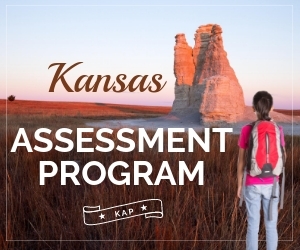 According to the Kansas State Department of Education, students in public and charter schools must take the Kansas Assessment Program (KAP) summative tests between March 13 and April 27, 2018. The exams are summative and formative, meaning they measure the total of student knowledge and inform educators of how they can alter their teaching methods to better suit students. The KAP consists of a series of tests in English language arts, mathematics, science and social studies. Schools look to KAP scores to assess the effectiveness of teaching and ensure students learn on par with state and federal standards. The KAP aligns with the Common Core, necessitating that students are involved in deeper learning and not just memorizing facts to fill out multiple-choice questions. The Kansas Center for Educational Testing and Evaluation (CETE) noted that educators provide KAP testing through the CETE Kansas Interactive Testing Engine (KITE). This online program allows the exams to adjust after each time a student provides an answer. If a child gets the question correct, KITE alters the next question to be a little more difficult. This adaptive method allows students to fully show their abilities with a more personalized test. KAP is a part of the Kansas content standards. While the testing does not provide teachers with curricula, educators create their lesson plans around giving students the tools they need to succeed on the KAP. This means delving into essays to talk about plot and characters much more than in the past, as well as working through math problems in much greater detail than in the past. Students will spend much of their regular class time working toward KAP tests, but you can give your kids an extra chance to prepare via practice exams. These online test examples show versions of questions similar to what students will encounter during the KAP testing. Many kids feel less anxious about the exams when they've navigated through the practice tests.